While I was designing my butterfly party theme, I did lots of procrastination research, looking on Pinterest and reading through my favorite blogs. By far and away the prettiest butterfly birthday party table I found was this one that was originally featured on Lil Blue Boo. The party – for 3-year-old Elle – is gorgeous and whimsical, and girlie without being childish. It would be just as lovely a baby shower or wedding shower! The child-size table and chairs were rented, and the lanterns came from Ebay. 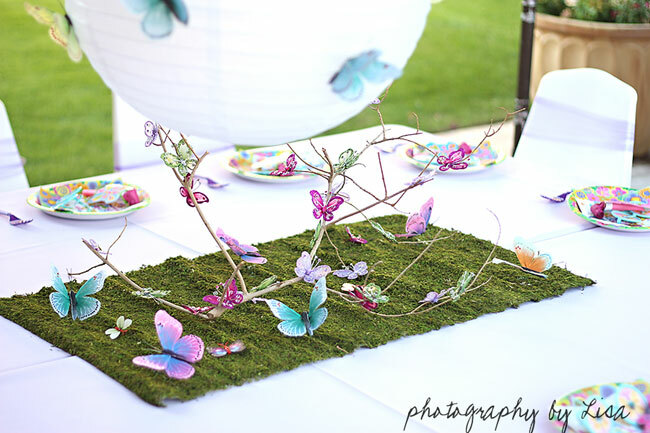 The centerpiece on the table is a natural tree branch decorated with butterflies. Quick, easy, and perfect! For more photos and details about Elle’s beautiful butterfly party, check out the original post on Lil Blue Boo. Photos re-posted with permission from Ashley of Lil Blue Boo. Thanks Ashley! Shop for personalized Butterfly Party paper goods and printables here. 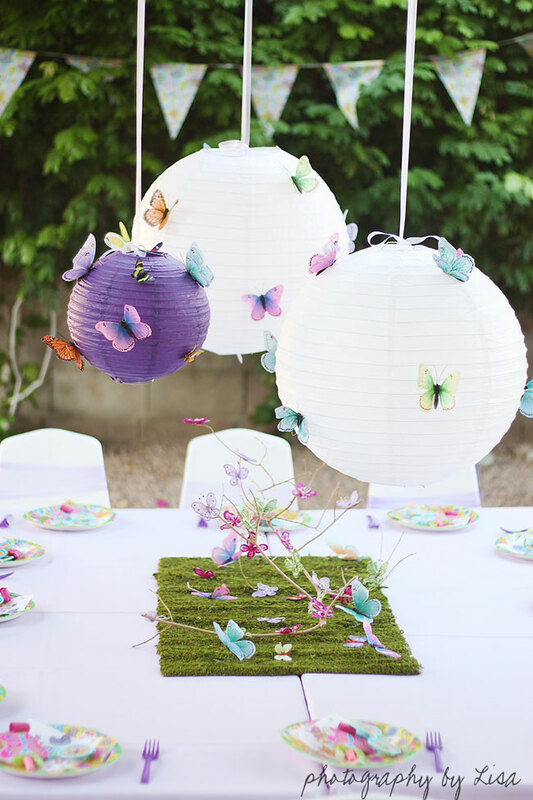 Or, check out more Butterfly Party ideas on Pinterest or here on my blog! Beautiful! I am so inspired - going to do some of this for Isabella's First Communion! Seriously gorgeous. I love this party! Super cute & fresh! Where did you buy the butterflies? Hi Clau! Unfortunately I don't know where the butterflies came from. The mom who planned the party suggests searching ebay for butterflies.